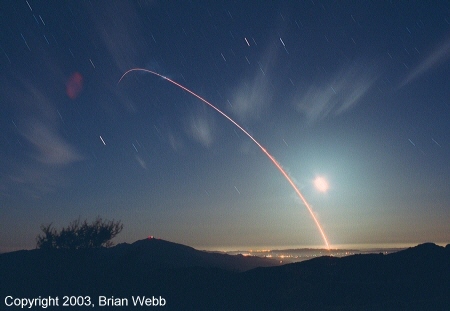 Time exposure photos of the 2003 March 12 night launch of a Peacekeeper ICBM from Vandenberg AFB. The Force Development Evaluation test launch, called a Glory Trip 32PA, sent eight unarmed reentry vehicles (warheads) to impact areas at the Kwajalein Missile Range in the central Pacific. The bright object on the right of both is the Moon and the white streaks are star trails. The distance to missile silo LF-02 was 51 statute miles (82 km). The photos were taken by Brian Webb from the mountains north of Santa Barbara, California. This is a cropped image from a medium angle time exposure showing the initial portion of the vehicle's first stage burn. 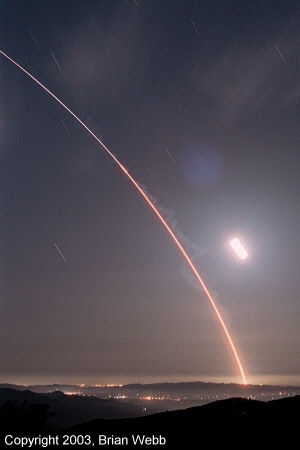 The second photo in this series is a wide-angle time exposure showing the entire boost phase of the launch from lift-off through third stage burn-out. Copyright © 2003-2006 Brian Webb. All rights reserved.